"No matter what I’ve ever thrown her way, she interprets everything I want so well." 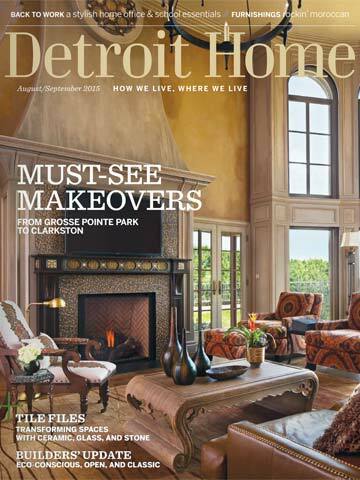 "Denise Anton David had no trouble putting her faith in her sister, Ann-Marie Anton, when it came to designing her new 6,800-square-foot house, built from the ground up two years ago." "I listen to what my clients want and work with them to achieve that result." 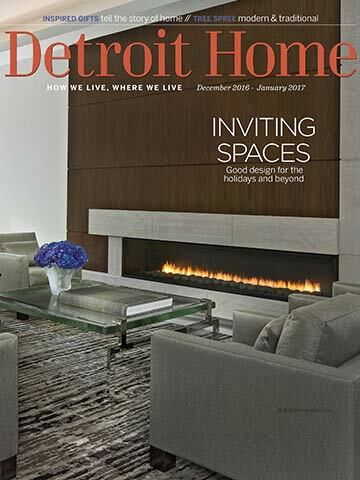 "Anton, who last year was honored with a first-place Detroit Home Design Award for Traditional Master Bedroom and this year was recognized in the Specialty Room category, was the perfect match for Belinda." "We wanted the space to have a playful spirit about it." 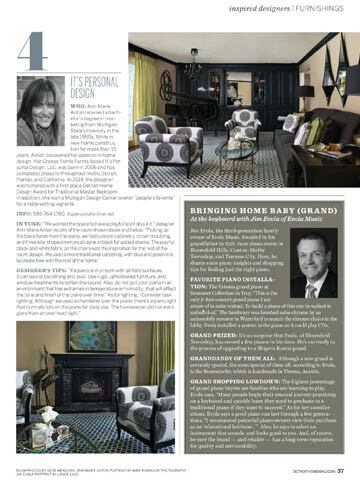 "Picking up the tones from the black piano, we had custom cabinetry, crown moudling, and three kite-shaped mirrors all done in black for added drama. The playful black and white fabric on the chairs was the inspiration for the rest of the room design." "We wanted to bring the outside in because she is really an outdoor person." "Nature plays a part throughout. 'The wife is an avid gardener who is really into nature and birds,' Anton says. 'We wanted to bring the outside in because she is really an outdoor person. 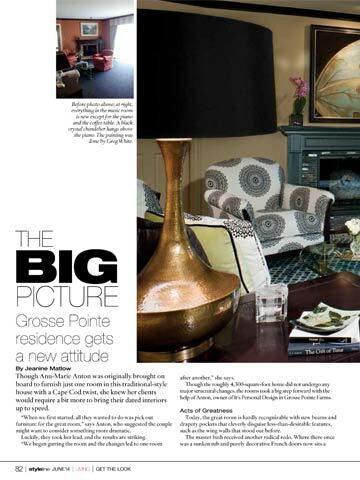 A nod to nature was one of the goals for the great room.'" "Life's greatest projects are born from dreams about the sheer magnitude of possibility." "The right interior designer can help us realize our dreams, and their expertise and artistic visions will blend with your lifestyle needs to create beautiful, functional rooms. Our hand-picked pros can work with your needs and budget." 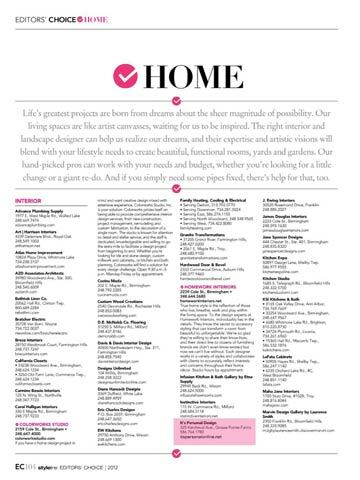 "Ann-Marie Anton of It's Personal Design was one of the three first-place winners." 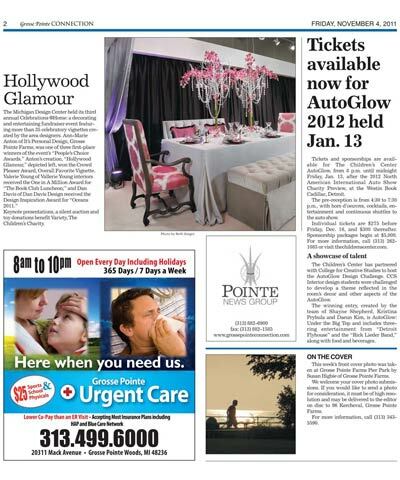 "At the Peopl's Choice Awards, Anton's creation, 'Hollywood Glamour,' won the Crowd Pleaser Award for Overall Favorite Vignette." "It's on the water so we wanted to carry through that tranquil feeling." 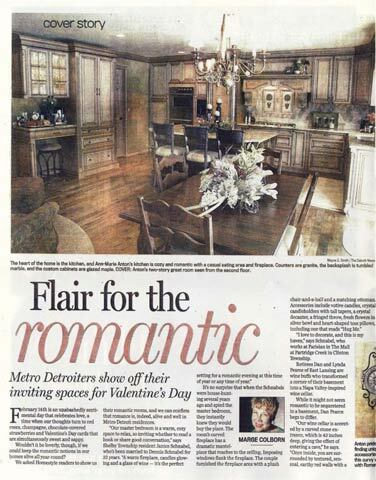 "Personal touches include the homeowner's favorite oil painting that hangs above the fireplace. The mantel was redesigned around the piece, and the wall behind it was painted a darker shade to make the art more prominent." "We wanted it to be sophistocated but inviting, too." "'We made it interesting with texture.' 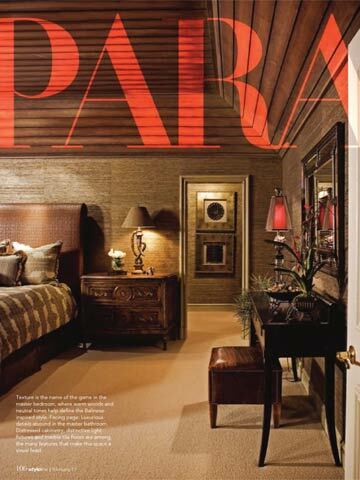 Dressers double as nightstands, and horn lamps are a lovely detail. 'It all started with the fabric for the duvet cover,' Anton says about the inspiration for the space." "It was very important for me to create a home that was uniquely mine and truly reflected who I was"
"Anton prides herself on finding unique accessories, such as a curvy wall clock with Roman numerals. 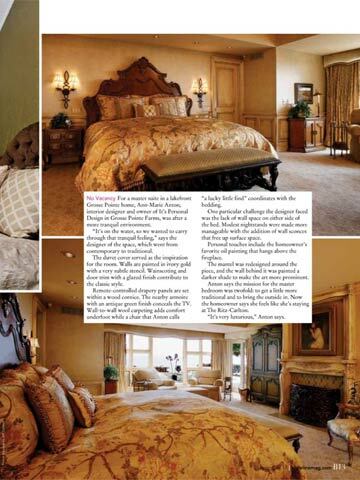 'My love has always been interior design,' says Anton."